Today marks the 65th anniversary of the D-Day landings, without the couragous spirit of those who went into battle that day we would not enjoy the freedoms we have today. According to some accounts MICKEY MOUSE was the pass word used by troops on D-Day. 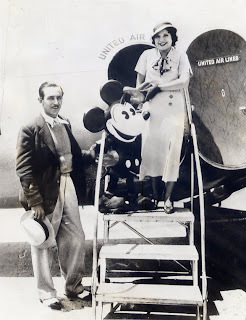 Hardly a surprise when by 1944 Mickey was so much a part of international culture. Here is a photo of Walt and Mickey arriving in Chicago on a visit to The Chicago Century Of Progress Exposition on July 18, 1933. 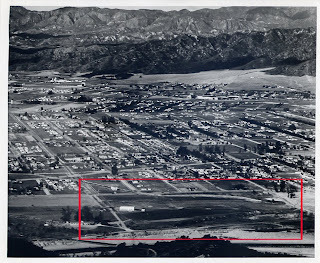 On August 31, 1938 Walt and Roy paid a deposit of $10 000 for the above 51 acres in Burbank. The total purchase price would come to $100 000 for the property which to this day remains the corporate headquarters of the Walt Disney Company. 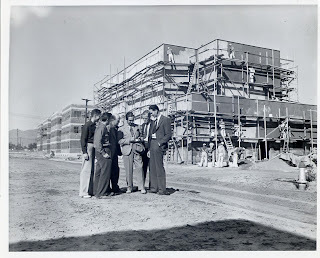 I imagine the above photo was taken around the time of purchase if not at the outset of construction.